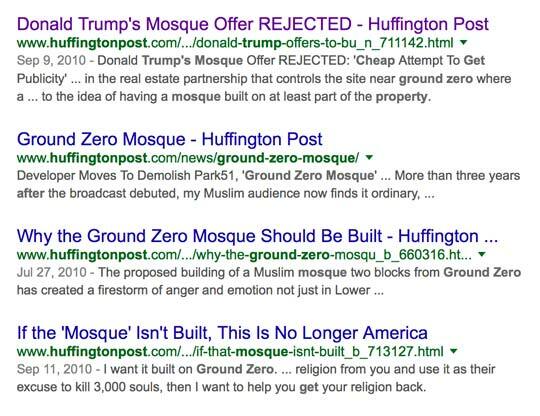 Donald Trump re Ground Zero Mosque. No Mosque! Instead, a generous offer. 2010. Donald Trump re Ground Zero Mosque. See his generous offer, his condition. the usual Huffington Post response. 2010. Donald Trump re Ground Zero Mosque. See his generous offer. See the condition he sets. Plus, see the usual Huffington Post response. I see a man who put his money where his mouth is and bought the land out from under the Ground Zero Mosque to stop it being built. That speaks volumes to me. Donald Trump is single-handedly trying to put an end to the controversial NYC mosque slated to be built near Ground Zero ... and he's doing it by flexing his wallet. Trump has offered to pay the owners of the property the amount they purchased the property for ... plus an extra 25%. . .
As part of the deal, Trump is asking that the mosque be built at least 5 blocks from the WTC site. Trump says he doesn't even think his offer is a good business deal, but he's doing it, "Because it will end a very serious, inflammatory, and highly divisive situation that is destined, in my opinion, to only get worse." Of course, Donald's offer is all cash. No word yet on how the offer is being received by the property owner. Donald Trump was just on CNBC talking about his rejected bid for the Ground Zero Mosque. He took the opportunity to tear the mosque developer Hisham Elzanaty a new one. "He's a low level real estate guy without money, and he's looking to flip it." 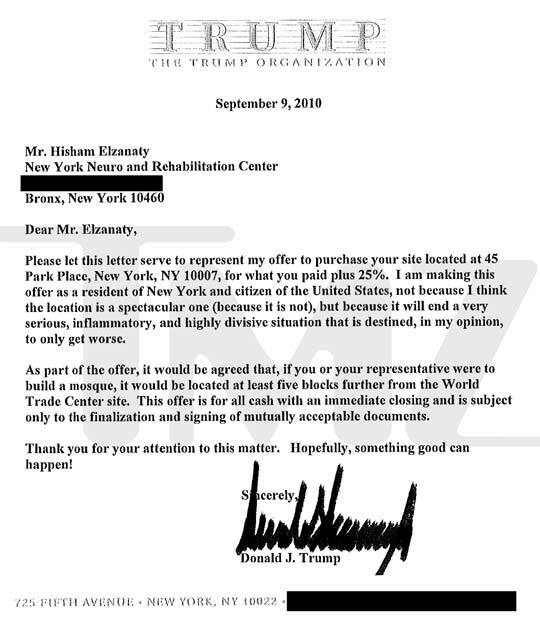 Trump, who offered $6 billion for the site, said Elzanaty's $20 billion price estimate was ridiculous. "The market's flat and he bought a property less than a year ago and he think it's gone up four-to-five times as much as it was. . . . I said the guys who sold it to you must have been stupid or something worse." Why didn't I know this? In 2010 I wasn't paying attention to Trump. How do I see Trump's offer? Like for my friend, for me as well, it's to Trump's credit. See his generous offer. See his condition. Plus, the usual Huffington Post response.